107 Nathaniel holding a song book during the evening service. 111 I need to take more photos of me, even if it means using my iPhone. Also, I wish I'm brave enough to actually wear a bright red lipstick outside the house. 112 Nathaniel and I went to Michaels after Ladies' Bible class and we stopped to admire and smell these beautiful flowers on our way back to the car. We repeatedly sang this song, too: "Smell the pretty flowers, smell the pretty flowers with the nose God gave you." That is genius! 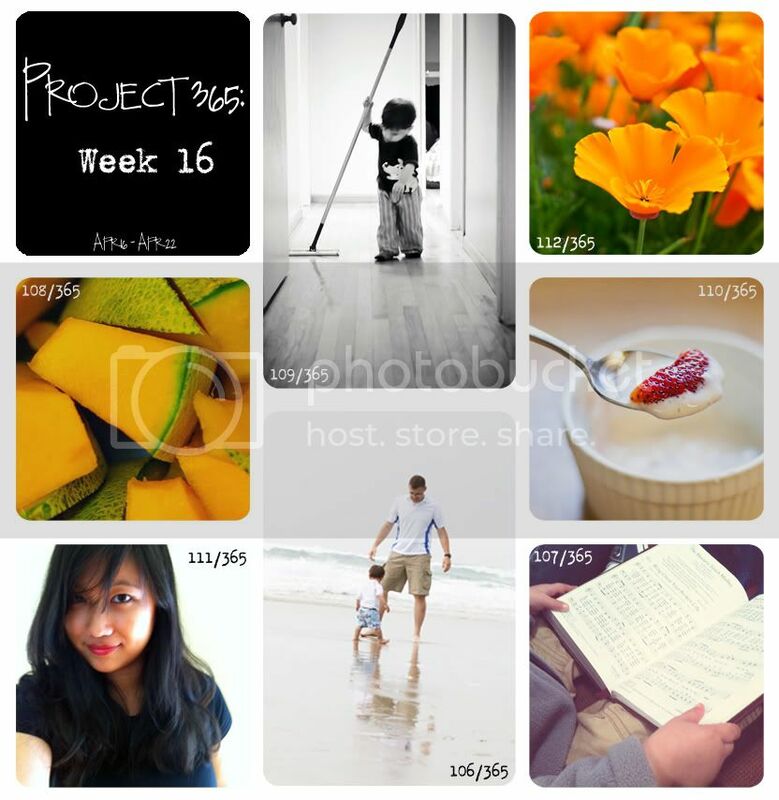 I've seen people do Project 365, but putting all 7 pictures from the week in one post is an amazing idea! I would like that so much better. I'd feel like I could post other things during the week other than those photos. Great post! And great photos! Love the orange flowers and the beach photos. Oh my goodness! I just got a little excited when I saw this! I've always wanted to do a 365 project and meant to start one this year on my birthday but I had a little too much on my mind so I forgot to do so! I LOVE the way you've done this. What a cute blog - Can't wait to read more! Wow! Gorgeous photos. Love them all, especially that beach phoot. Great snapshots! Love the little guy doing chores, so cute. Have a great day! new follower (oh, that sounds creepy)... Love the way you've set up your project. Such a great way to chart the year. Where'd the template come from?